As the road season nears a close, it enters its final, very violent death throes with the hill climbs. Peculiar to Great Britain, these short uphill time trials are some of the most intense races you can do, but with a decent crowd and a tough hill to conquer, can be very rewarding for anyone who enters them. 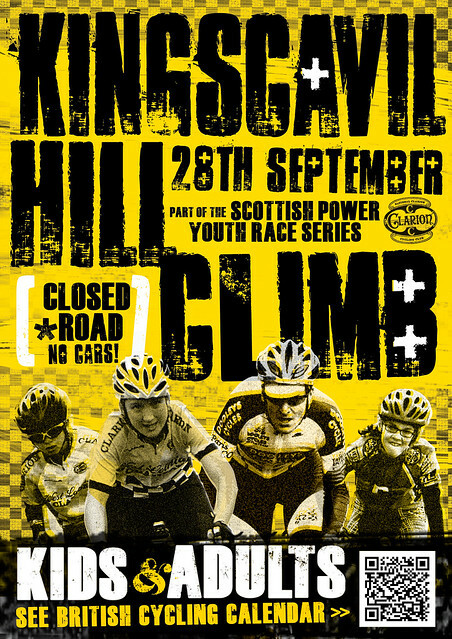 Kingscavil hosts one of these hill climbs, run by the West Lothian Clarion and club member Debbie Pollard has kindly contributed this piece on the hill and the event. Cycling is a huge part of my life, my main hobby, the only sport I have ever loved, a source of great pleasure, and one of those precious things that helps keep life in balance. But it has a dark side. Climbing. I am not a natural climber. Kingscavil Hill occupies a special place in my mind. A dark wee place of hidden fears. A place of nightmares and panic. I shudder a little each time I pass the turn-off for Kingscavil. Two or three times a year, however, I allow the hill out of that place so that I can challenge it. The hill is just less than a kilometer in length. The gradient maxes out at 20%. But mere statistics don’t do it justice. My first attempt was in 2009. 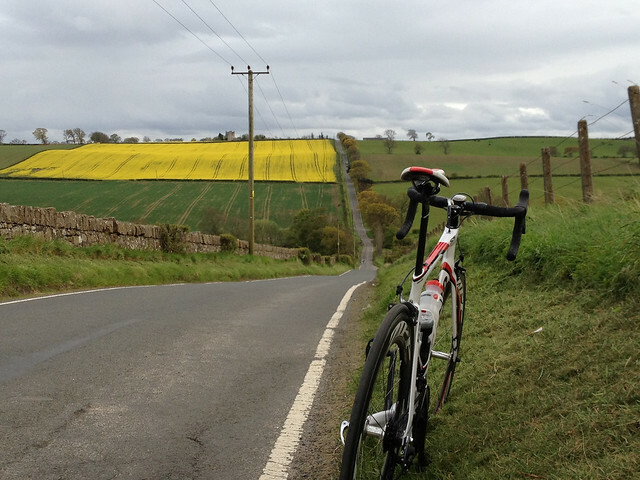 I was new to club cycling and yet to pluck up the courage to ride a fully-fledged road bike. My Specialized Vita hybrid was a good substitute. Relatively light, skinny tyres and a triple chainset. That bike could take me anywhere. I’d heard of the hill, of course, sometimes in hushed tones, but not given it too much thought. As I neared the hill, I could see it in the distance. It positively loomed, a cold grey streak cutting through the fields on a steep north-facing slope. Forbidding. Foreboding. I should have turned around. But I didn’t. The final approach to the hill is a small but fast descent to a bridge, then it ramps up alarmingly. It’s like staring at a big grey wall. As a small child, growing up near the Firth of Clyde, I had a fear of falling off the steepest of hills, thinking I might roll right into the river. Kingscavil is a hill that brings back that terror. Will my wheels actually grip? Will I slide down? Where will I land? My inexperience led me to think that gaining momentum and hitting the hill hard at the bottom was the way to go. I was about 2/3 of the way up the first ramp when I had to stop, burst. Still, I got my breath back and started again. Not far to go, over the brow. NO! There’s more of it. So much more. Off again. Try to climb the second ramp, low gear this time, steady does it. This ramp is the longest. One stop in the middle, back on, up over the brow and……… ramp 3! Another stop and I finally made it, pedalling squares and seeing stars, to the top. I estimate that it took me about 15 minutes to get up there that day. A very humbling lesson. I kept away for 6 months after that, before attempting it again. This time, in a low gear, I made it to the top in one go. Heart beating out of my chest, unsure whether to faint or vomit. But I had conquered the beast, in around five minutes of pain. I have since climbed Kingscavil two or three times a year. The shallow parts between the steep ramps allow you some recovery, or to gain speed, depending on your ability. Gear selection is key, as is the awareness that there is so much more to the hill than you can see. I entered the club confined hill climb in 2010 and was the first lady to the top in 4.57. At the Open hill climb the following year, this time on a road bike, I was about halfway down the ladies field with a huge personal best of 4.27. I have climbed it as part of the clubs challenge rides, Church to Perdition (Kingscavil Church to the top of the hill) and Sea to Sky (Blackness to The Knock and back) but never for pleasure. The women’s record of 2.53 was set by Jen Taylor in 2012 (West Lothian Clarion) while the men’s record of 2.10 is held by Steven Lawley (The bicycle Works). Previous winners/record holders include Arthur Doyle and David Griffiths, Sharon Doyle and the Clarion’s very own Michelle Gregory. It takes almost a super-human effort to climb the hill and am I in awe of those athletes who can do it so quickly. It only takes a few minutes but the mental effort required to keep turning those pedals is enormous. At my worst moment on the hill, as recorded by Garmin, I was travelling at 2.8 mph whilst my heart hammered 178 times per minute. And I consider myself reasonably fit! 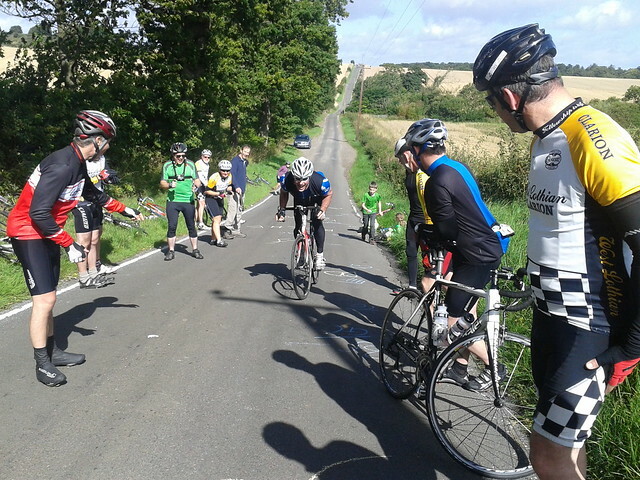 I have entered the Open Hill Climb (Saturday 28 Sep 2013 – ed) this year and, for me, September is a month of hill repeats and abstinence from chocolate. Every pound counts on that hill. Every last ounce in fact. Every muscle fibre, every cell will burn with lactate. My lungs will be raw with effort at the top. I may cough for 24 hours afterwards. I’ll certainly be dizzy, possibly feeling sick. Will it be worth it? Oh yes! Getting to the top is always worth it. The event itself is fantastic. The smaller kids race on the slope opposite the main hill. Youths of 12 and over must tackle the main hill, along with the juniors and seniors. Each year they do so with astonishing courage, skill and determination. And speed. The closed road allows for plenty of spectators who will shout, ring cowbells and cheer you to the top, through the pain. Perhaps some Tour de France style angels and devils will help you on your way. A piper adds to the party atmosphere. This year I am aiming to get to the top in less than 4 minutes. Achievable but by no means a certainty. I will train hard, watch what I eat and use every morsel of adrenaline and sheer effort my body can produce on the day. And I now own a very light carbon bike and recently acquired some posh wheels for it. If, on 28th September, I have a new Personal Best, I will have won the latest round in my battle with Kingscavil. The hill will then retreat to lurk in that small part of my mind until I am ready to do battle once more. This entry was posted in Routes / Rides and tagged climbing, Scotland on September 14, 2013 by Owen.